It's going to take a little bit longer for a court to determine just how mentally competent 93-year-old Sumner Redstone is. A judge in Canton, Massachusetts offered no decision at a hearing Tuesday as to whether he will expedite a lawsuit involving the media mogul due to his deteriorating health. "Nobody could reasonably deny that there's a grave risk that Sumner Redstone will not be long available to give evidence to this trial," said attorney Les Fagen, who is representing Viacom CEO Philippe Dauman and Viacom board member George Abrams. There were 22 lawyers at the hearing, all seeking an opportunity to speak on behalf of Viacom, the Redstones or one of Redstone's trustees. 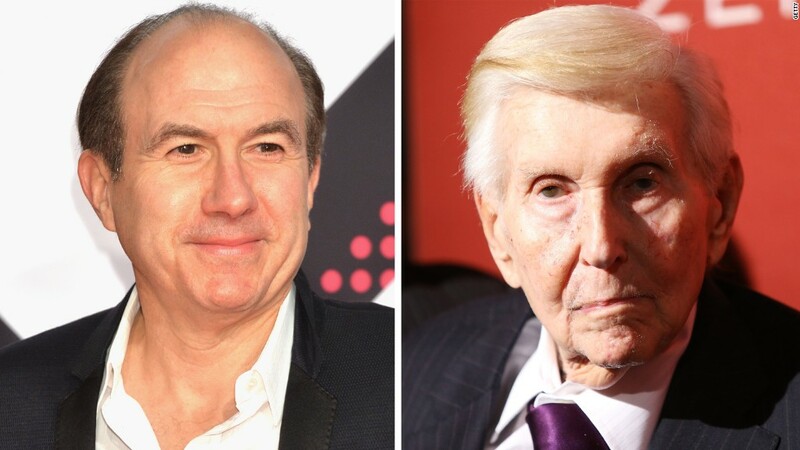 The two executives argue in their suit that they should not be removed from Redstone's trust, which will control Viacom (VIA) and Redstone's other media company, CBS (CBS), after he dies or is incapacitated. Dauman and Abrams have requested an immediate medical examination of Redstone, alleging that their ouster from the trust was orchestrated by Redstone's daughter, Shari, who they say is "isolating" her father. Fagen said Tuesday that Dauman and Abrams have been perhaps Sumner Redstone's "two closest colleagues in the world" -- a far cry from the mogul's relationship with his daughter. "Mr. Redstone and his daughter have had a bitter and hostile relationship for years," Fagen said. "Throughout, Mr. Redstone has denied Shari control -- both in his life and after death." Robert Klieger, an attorney representing Sumner Redstone, countered by claiming that his client exercises daily and makes frequent visits to his friends. Although he conceded that Redstone suffers from severe speech impairment, Klieger asserted that Redstone undoubtedly possesses the mental capacity necessary to oversee his empire. To prove Redstone's acumen, Klieger shared a message that the media mogul wants to personally convey to the board: Don't sell a stake in Paramount Pictures. Dauman had aimed to sell Viacom's stake in Paramount by the end of the month, but those plans were jeopardized on Monday after Redstone's National Amusements altered its bylaws to make it harder to complete a sale. Redstone, who receives around-the-clock care, was not present in the Massachusetts courtroom on Tuesday. Last week, the Redstone camp produced a report from a geriatric psychiatrist who recently examined him and concluded that he is capable of removing Dauman and Abrams from the trust. Klieger pointed out that three doctors must declare Redstone incapacitated and unable to oversee the trust. In fact, no doctor has done that so far.